Upto this day for travelling to Scotland we had always taken the train or the car and the ferry. This time the car stayed at home and we tried the plane. Let me tell you: Once bitten, twice shy! Checking in was already something very special. "Unfortunately the flight is overbooked, you have to go via Frankfurt", an offical of XLM (name slightly changed) explained to us with a sardonic smirk. Hum, begging pardon, but what for did we book seats? We declined the offered 75 Euro, the offered free visit to a hairdresser plus any kind of perks on the next flight. Landing somewhere nowhere did not appear very tempting to us. Their fashion of overbooking flights is actually not our business. A short time later with the body check there was the first confrontation with authorities in arms. My beloved Zippo-lighter was ranking as danger for the safety on board and the peace of the world. None of the three uniformed gentlemen on my request desired to buy the lighter on good terms. So together with my fuel-lighter I had to leave the airport building to "burn it empty" as the officer humorously suggested. Nice trick! Until the fuel had burnt out, the plane would have been in the air and the problem of overbooking brilliantly solved. So outside the building I took out wick and cotton and stuffed everything into my trouser pocket. Nevertheless the departure went quite wrong. With a delay of 45 minutes the plane took off. The next drama was waiting for us in Amsterdam. While still being in the stack over Amsterdam and yearningly looking down to the ferry port of Ijmuiden (below), the captain informed over loudspeaker that there will not be any difficulty at all reaching the connecting flight to Edinburgh. Swell, so we jacknifed out of the plane - to waste valuable time at the next check. Down there is Ijmuiden - here the ferries to Newcastle are starting. "Wat is dit?" the Dutch safety expert gasped when searching my purse. I remained where I was, facing some problems with my slipping trousers the belt of which - most suspicious - had long been taken from me to be thoroughly examined by a safety team. "Dit is an file", I explained in my very best Dutch. I was not certain but felt like all snipers of the border officials going into position at this moment. Very slowly I moved towards the terrified officer, having some trouble not to stumble over my working down trousers. Indeed I had been missing that dastard nail file for some time; it had hidden in one of the wallet compartments. A hastily called in team of experts did not succeed even with their best efforts to lure the coward file out of its hiding place. The situation appeared to be out of control. In the distance I heard the wailing of sirens - was this the Dutch Royal Army approaching? One general looked straight into my eyes for a long time - I stood my ground. He then said: "All right!" The file was permitted to pass. In spite of a record-breaking sprint there was nothing doing as to the connecting fligth. The plane had not taken off (delayed?) but the sign "Gate closed" smirked at us. The area was deserted like the German Bundestag during a debate on voters' frustration. Demotivated, we crept back to the XLM-booth. "Oops, I'm sorry, but these things happen", a blue cladded lady consoled us. "You could try it once more in three hours. Seats? Why seats? If nothing is vacant, you try the next fligh in... six or eight hours!" Several safety officers hindered me in in dismanteling the XLM-counter. For consolation we received a few vouchers which we accepted listlessly. However, we could squander the vouchers at 'Murphy's Pub' (recommendable). Thus sustained, we took along the remaining vouchers - we had a plan! Back now to the XLM-counter. The safety teams around us cocked their weapons when we approached the counter. With the most innocent of all innocent faces and with friendly smiles we put the pile of vouchers onto the counter. "One upgrade on the Edinburgh flight, please. Thank you!" Silence in the complete terminal! German hackers without mery attacked the one weak point in the otherwise safe system. The Royal Army around us was powerless; no orders were existing for a case like this! Followed a hectic phone marathon while we stood by, waiting with innocent faces. After several recalls of the Royal Home Office and Government representatives some brigthly smiling she-major handed us tickets for the very best seats in the plane. Here we are, there's a peaceful solution for everything! Soon we enjoyed the flight to Edinburgh while the Royal Dutch Army retreated today. Touchdown in Edinburgh went without problems. Back on Scottish ground at last. Now everything would be different. It was indeed, no body-groping, friendly welcome with bright sunshine and a few minutes later we were standing at the stop of bus line 19. We bought a return ticket as we had scheduled to go back in a few days. On we went with a double-decker zu Waverly Station, right in the city of Edinburgh. Half an hour later we reached there. The sun was bright and we moved into our quarters. We soon made friends here, especially with a Scottish plumber who visited us several times. In all he came three times to solve a little problem with a tap which did not want to splash any water. We quite took him to our hearts but on a rainy day we unfortunately had to leave. In the distance we could make out Arthur's Seat. From there we had had a great view on the town. 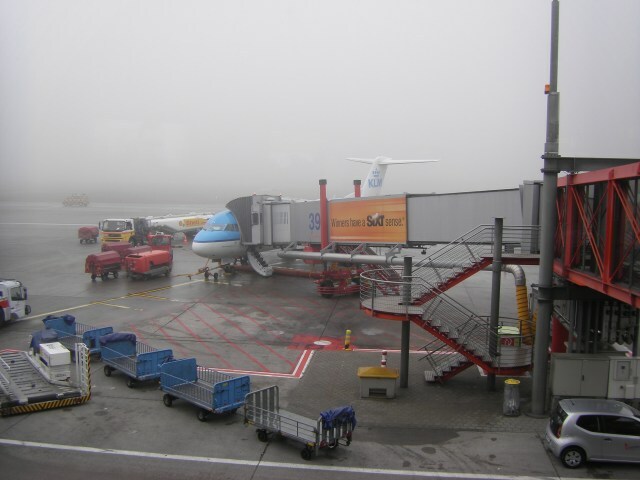 Changing in Schiphol/Amsterdam? An olympic race with time. Perhaps they created the film title "Amsterdamned" here. Probably our looking a little bit knocked out after a 2 km spurt caused the border authorities to have mercy. A short inspection and we, bathed in sweat, were allowed to climb into the bus to the plane. Finally we apporached cloud-covered Hamburg. Here are the last minutes of the flight. Dear author! Many thanks for getting here and publishing so actually articles. There is a person who appreciate it and mention thank you! In my viewpoint, not many blogers own so numerous options to develop new, appealing articles. Thank you for doing it and I really want you did not lose the motivation to make the unique ones!